Thank you for the kind words of encouragement, concerned passer-by! Fortunately, for every grouchy old man on the street who disapproves of the bakfiets, we pass dozens of others who are fascinated by the whole endeavor. We met old man on the way to the twins’ 15-month doctor’s appointment this afternoon. On the way back, we stopped for snacks, and S came along. She rode on the rack for the three blocks to the cafe and when we pulled up, the people at the tables outside told us our entrance was the best thing they’d seen all day. (We will shortly get a photo). I’m continually amazed by people’s enthusiasm for the bakfiets and for bikes in general when we stop to talk. If I were to gauge the state of cycling in our town based on those conversations alone, I would conclude the streets must be clogged with bikes, which they obviously aren’t. That best thing you saw all day could be your life! You just have to get on your bike. It’s not the terrible, awful danger we make it out to be. The longer I ride, the more I’m convinced our unique brand of paranoia and fear is what stunts our drive to get our bikes on the streets. 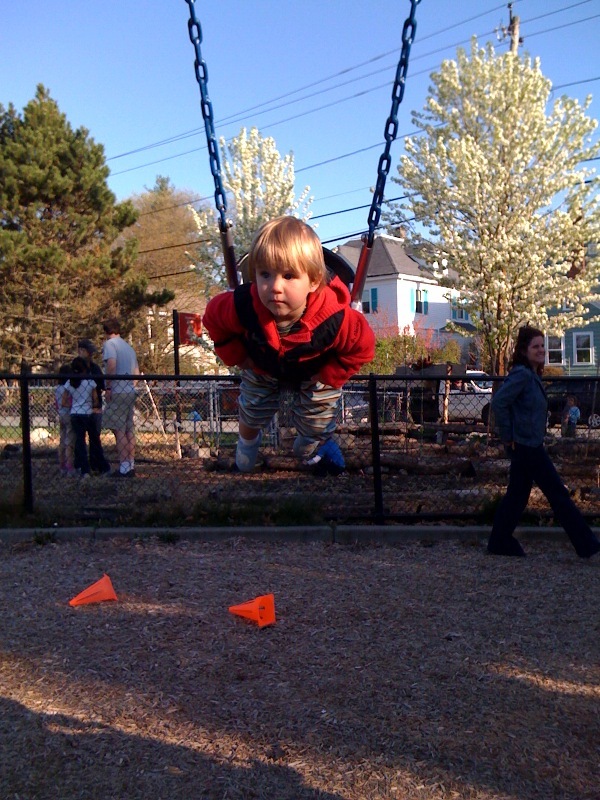 Now, enjoy this photo of R at the playground, post-check-up, post-shots, post-meltdown, post-juice-and-cookie, post-gravity. Because as we all know, if a cyclist is killed, it’s their own fault. Fortunately, as with you, we find 99% of people are positive about the Bakfiets and the other 1% are usually driving a big status-symbol SUV and don’t like the fact we are in front of them. Safety is Subjective…motor vehicles in the hands of their careless operators kill 40,000 people a year and injure another 2.9 million. Cycling is much safer.